This healing plan assists you in clearing and healing emotional wounding from childhood. Whether you had great or dysfunctional parents, you have a degree of childhood wounding that interferes with reaching your potential and living your truth as an adult. As you move through this healing experience, be kind and gentle with yourself. You are accessing and allowing repressed emotion to surface and clear so you can reclaim this energy and your true self to help you progress in your healing. Take note of any emotion you are processing and acknowledge that it is repressed emotion wanting to be cleared. Make extra effort these next four weeks to not let this energy create drama or issues by projecting it onto others and your current life story. Keep turning within yourself and connecting with your inner child who is finally feeling safe enough to feel what possibly has never been given permission to be felt before. Feeling is healing and this healing plan is designed to support you in the process. At the end of this 4-week healing plan, you will be free from old emotional triggers connected to your wounded child. You will also feel a deep connection with your child self, which supports you in integrating all stages of life and operating in more wholeness and awareness as an adult. 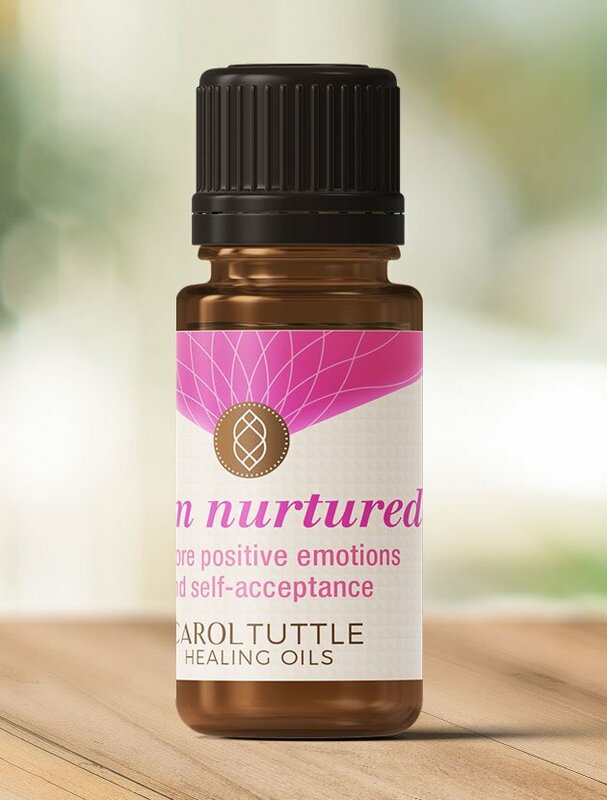 The oil customized to support you in this Healing Plan: I am nurtured. Do these short exercises each day of this 4-week healing plan (or as recommended). In other words, do these practices along with the healing sessions for Week 1. When you move on to Week 2, continue to do these practices daily. The list may look long, but the techniques are quick once you’re familiar with them. Each technique helps you heal from childhood wounding. Listen here or download and listen on the go. This audio session will help you feel safe to allow uncomfortable emotions to surface, so you can heal them as you move through this healing plan. Listen to this every day or you can choose to alternate it with the next audio track of affirmations. Do this visualization 2-3 times each week of the plan. It is not necessary to do it every day. This visualization assists you giving your inner child the validation you needed through all stages of your childhood and teens. You are re-parenting yourself to give the love and validation you have been seeking since childhood. This will support you in suspending any people-pleasing tendencies, which allows you to make choices because they are correct, rather than because you are trying to feel loved and valuable. Each day, write a thought or note to your inner child and have your inner child write back. Use your dominant hand to write to your inner child. Use your non-dominant hand to write the response from your inner child. Sound healing, using Tibetan healing bowls, helps you process, clear, and ground your energy. They activate your energy centers to help you express your true self with more ease. Listen to this track while you journal, visualize, go on walks, or as you fall asleep at night. In this first week of your healing plan, watch each healing session at least once. This week, you will clear repressed emotions and limiting patterns imprinted from your birth and baby years. Space out the sessions among consecutive days. (All at once is too much!) If you have time, watch each session twice. You can also watch any of these healing sessions at any time when they would be supportive. Birth is the original event that imprints us with the energy of pain and struggle. The events of your birth may have left you with energy patterns that keep you recreating stressful scenarios in your life. You will clear those patterns in this session. This session will assist you in clearing the energy of pain and struggle that we are all imprinted with from our birth experience. You will create a new birth story that connects you with the energy of affluence, ease, and joy. From birth to 6 months old in your child development, you needed validation from your parents that you were loved and valuable and deserve to thrive. If this emotional need was not fully met, you can now be the one to give yourself what you emotionally needed as an infant. Opening up repressed emotion and beliefs from your childhood and teen years may cause you to feel vulnerable and powerless. This clearing session will support you in feeling that it is timely and safe to do this. You can change the word pattern to the words belief or feeling. For example: “It is safe to get over this pattern.” You can change this wording to: “It is safe to let go of these repressed emotions/beliefs”. Limiting beliefs you took on as your identity during childhood still influence your self-perception and cause you to attract issues that can now be healed. This session helps you scramble negative beliefs so you can free up your energy and claim your truth. Watch each of the 4 healing sessions below at least one time. Watch sessions twice if you have time, or again at any time when they would be supportive. This week, you are clearing any repressed emotions and limiting beliefs you took on in your early childhood. Each day of this week, continue to do the 4 practices under the “Daily” tab. From 6-18 months old, you needed support to feel safe to start moving through the world. Without that support then, you may not fully trust your senses now. For example, you may feel you do not have permission to move forward with your life, or you are moving in the “wrong” direction. This clearing will help you feel safe and secure to move through the world, true to you. From 18 months to 3 years old, you were learning how to speak and use your voice to express yourself. If you did not feel safe to speak, or if you were corrected a lot as a small child, you were not supported in developing your true voice. This session will help you clear away interference that keeps you from using your voice. By healing the part of you that was wounded at the time you were developing your voice, you will better be able to speak your truth as an adult. In your childhood, you discovered strategies to get your emotional needs met, such as whining, crying, or getting upset. This session will assist you in clearing unknown patterns of misused emotion, allowing you to meet your unmet childhood needs and re-parent yourself during this 4-week healing experience. It is common and reasonable to feel grief and sadness about any childhood wounding that occurred in your life. When you do this clearing session, focus on your inner child by having a picture of yourself as a child present during the session. Watch each of the 4 healing sessions below at least one time. Watch sessions twice if you have time, or again at any time when they would be supportive. This week, you are clearing any repressed emotions and limiting beliefs you took on in your middle childhood years. From 3-6 years old, you were learning to be your own person and to know your own identity and how to use your personal power. If you were shamed, you could have questioned your identity and power and repressed it. This session helps you reconnect with the right and power to create a life true to you. From 6-12 years old, you needed to understand the purpose of structures and have support to create your own guidelines. If your parents were absent or controlling, you’ll have wounding here. For example, you may find it challenging to stay organized, or organize your day to day life. You may be sabotaging yourself which keeps you from reaching your goals. This session supports you in creating structure to organize your life, and pursue your goals. In childhood, you took on beliefs that you should be or do certain things to become more lovable or acceptable. This session helps you clear away “should”s you still carry, such as: “I should do more, I should cater to you, I should feel guilty, or I should disappear.” Use any of the previous statements along with coming up with your own shoulds that you are ready to clear. When your needs were not met in childhood, you may have felt betrayed. When you do this clearing session, focus on your inner child by having a picture of yourself as a child present. Watch each of the 4 healing sessions below at least one time this week. This week, you are clearing any repressed emotions and limiting beliefs you took on in your teen years. It’s the final week of your healing plan. Stick with it! Each day of this week, continue to do the 4 practices under the Daily tab. From 13-18 years old, you needed support to create personal independence as well as learning the skills you needed to be successful in your adult life. You also needed to feel accepted by your peers and that you had value to others outside your family group. Without the full support you needed, you may be blocked or wounded now. This session will help you experience healthy independence so you can create a successful life as an adult. Anger can materialize during our teens for unmet needs, unsupportive communication with parents, or fear and uneasiness about adult life. When you watch this session, focus on your inner child by having a picture of yourself as a teen present with you. This healing session assists you in integrating the emotions you have experienced during this 4-week healing plan. Your 7-chakra energy system is directly related to your emotional development as a child. Just listening to the sounds will integrate your emotional energy. This general clearing session will support you in healing your inner child and free you of any misperceptions you may carry about yourself. Watch this again. When you are born in the visualization, tell your infant self who you are, according to your Energy Type. This will strengthen your confidence in who you truly are. Supports deep emotional healing and self-acceptance. Emotional restoration. Restores a sense of who you truly are and how you truly feel and think. Mother of Pearl: Awakens the primordial memory of your origin in the infinite ocean of divine love. Repairs the deep wounds created by unfulfilled needs. Imparts the feeling of being cradled in a loving mother’s arms. Rhodonite: Soothes and brings order to feelings that are scattered, imbalanced, or ungrounded. Rhodonite broadens your perspective and deepens your understanding of your emotions, helping you become more balanced, mature, and strong.